A low-complexity soft-decision 12.5 Gb/s optical receiver for decoding low-density parity-check codes reusing conventional hard-decision receivers is investigated. The simulated and experimental results show that the proposed optical receiver exhibits coding gains of 2.75 and 6.73 dB for post-forward-error-correction bit error rates of 10−4 and 10−9, respectively, over a hard-decision uncoded system for a 60 km single-mode optical fiber transmission. The soft-decision circuitry consumes approximately 5 W and is optimized to provide two confidence levels, one above and one below the hard-decision levels. F. Chang, K. Onohara, and T. Mizuochi, "Forward error correction for 100 G transport networks," IEEE Commun. Mag. 48, (3), S48‒S55 (2010). T. Mizuochi, "Recent progress in forward error correction and its interplay with transmission impairments," IEEE J. Sel. Top. Quantum Electron. 12, (4), 544‒554 (2006). I. B. Djordjevic, M. Arabaci, and L. L. Minkov, "Next generation FEC for high-capacity communication in optical transport networks (Invited)," J. Lightwave Technol. 27, (16), 3518‒3530 (2009). A. Tychopoulos, O. Koufopavlou, and I. Tomkos, "FEC in optical communications—a tutorial overview on the evolution of architectures and the future prospects of outband and inband FEC for optical communications," IEEE Circuits Devices Mag. 22, (6), 79‒86 (2006). "Series G: Transmission systems and media, digital systems and networks, digital sections and digital line system—optical fibre submarine cable systems: forward error correction for high bit-rate DWDM submarine systems," ITU-T Recommendation G.975.1, 2006. R. Gallager, "Low-density parity-check codes," IRE Trans. Inf. Theory 8, (1), 21‒28 (1962). R. Gallager, Low density parity check codes (Ph.D. dissertation), Cambridge, MA, MIT, 1963. C. Berrou, A. Glavieux, and P. Thitimajshima, "Near Shannon limit error-correcting coding and decoding: turbo-codes," Proc. of IEEE Int. Conf. on Communications (ICC 1993), Vol. 2, May 1993, pp. 1064‒1070. S. Y. Chung, G. D. Forney, T. J. Richardson, and R. Urbanke, "On the design of low-density parity-check codes within 0.0045 dB of the Shannon limit," IEEE Commun. Lett. 5, (2), 58‒60 (2001). R. Tanner, "A recursive approach to low complexity codes," IEEE Trans. Inf. Theory 27, (5), 533‒547 (1981). V. Zyavlov and M. Pinsker, "Estimation of the error-correction complexity of Gallager low density codes," Probl. Peredachi Inf. 11, (1), 23‒26 (1975). S. Tehrani, C. Winstead, W. Gross, S. Mannor, S. Howard, and V. Gaudet, "Relaxation dynamics in stochastic iterative decoders," IEEE Trans. Signal Process. 58, (11), 5955‒5961 (2010). T. Mohsenin, D. Truong, and B. Baas, "A low-complexity message passing algorithm for reduced routing congestion in LDPC decoders," IEEE Trans. Circuits Syst., I: Regul. Pap. 57, (5), 1048‒1061 (2010). D. Declercq and M. Fossorier, "Decoding algorithms for nonbinary LDPC codes over GF(q)," IEEE Trans. Commun. 55, (4), 633‒643 (2007). B. Vasic and I. B. Djordjevic, "Low-density parity check codes for long haul optical communications systems," IEEE Photon. Technol. Lett. 14, (8), 1208‒1210 (2002). I. B. Djordjevic, S. Sankaranarayanan, S. K. Chilappagari, and B. Vasic, "Low-density parity-check codes for 40-Gb/s optical transmission system," IEEE J. Sel. Top. Quantum Electron. 12, (4), 555‒562 (2006). T. Mizuochi, Y. Konishi, Y. Miyata, T. Inoue, K. Onohara, S. Kametani, T. Sugihara, K. Kubo, H. Yoshida, T. Kobayashi, and T. Ichikawa, "Experimental demonstration of concatenated LDPC and RS codes by FPGAs emulation," IEEE Photon. Technol. Lett. 21, (18), 1302‒1304 (2009). T. Kobayashi, S. Kametani, K. Shimizu, K. Onohara, H. Tagami, and T. Mizuochi, "Soft-decision LSI operating at 32 Gsample/s for LDPC FEC-based optical transmission systems," Optical Fiber Communication Conf., Mar. 2009, OWE2. K. Onohara, Y. Miyata, T. Sugihara, K. Kubo, H. Yoshida, and T. Mizuochi, "Soft-decision FEC for 100G transport systems," Optical Fiber Communication Conf., Mar. 2010, OThL1. Y. Miyata, K. Sugihara, W. Matsumoto, K. Onohara, T. Sugihara, K. Kubo, H. Yoshida, and T. Mizuochi, "A triple-concatenated FEC using soft-decision decoding for 100 Gb/s optical transmission," Optical Fiber Communication Conf., Mar. 2010, OThL3. 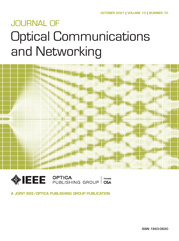 E. Masalkina, H. Bülow, R. Dischler, M. Matuszak, and R. Urbansky, "Soft-FEC implementation for high-speed coherent optical OFDM systems," Proc. Photonische Netze (ITG-FB 222), Mar. 2010. Q. Yang, A. Amin, X. Chen, Y. Ma, S. Chen, and W. Shieh, "428-Gb/s single-channel coherent optical OFDM transmission over 960-km SSMF with constellation expansion and LDPC coding," Opt. Express 18, (16), 16883‒16889 (2010). K. P. Ho and H. C. Wang, "Soft-decoding of low-density parity check codes for DPSK signals," Optical Fiber Communication Conf. and Expo. and the Nat. Fiber Optic Engineers Conf., Mar. 2007, OWE7. I. B. Djordjevic, L. Xu, and T. Wang, "On the reduced-complexity of LDPC decoders for ultra-high-speed optical transmission," Opt. Express 18, (22), 23371‒23377 (2010). G. P. Agrawal, Lightwave Technology: Telecommunication Systems, Wiley, 2005, ch. 6, p. 202. K. Shimuzu, Y. Miyata, T. Mizuochi, K. Ouchi, T. Kobayashi, H. Yoshida, and K. Motoshima, "Optimum soft-decision FEC thresholds for on–off optical receiver using block turbo code," Optical Fiber Communication Conf., Dec. 2004, WM2. G. Bosco, G. Montorsi, and S. Benedetto, "Soft decoding in optical systems," IEEE Trans. Commun. 51, (8), 1258‒1265 (2003). G. Bosco and S. Benedetto, "Soft decoding in optical systems: turbo product codes vs. LDPC codes," Optical Communication Theory and Techniques, Springer, 2005, pp. 79‒86. G. P. Agrawal, Fiber-Optic Communication Systems, 4th ed., Wiley, 2010, ch. 4. Fig. 1 (Color online) Physical interpretation of the soft-decision thresholds. Fig. 2 (Color online) Low complexity soft-decision circuit with x % of optical power used for the hard decision and ( 1 − x )% for the soft decision. Fig. 3 (Color online) Output eye of the soft-decision circuit at 12.5 Gb/s. Fig. 4 (Color online) Optical test bed for performance evaluation of the soft-decision circuit. Fig. 5 Received optical spectrum at (a) point C, after the MZM, and (b) point G, just before photodetection (0.1 nm). Fig. 6 (Color online) Captured frames in the time domain: (a) 3 frames and (b) zoomed at the frame intersection. Fig. 7 (Color online) Experimental amplitude histogram of the captured signal (1-frame) input to the soft-decision circuit and threshold positions for Q = 8 . 6 dB. Fig. 8 (Color online) Optimized decision thresholds as a function of Q in the waterfall region of the curve (squares: experimental results). Fig. 9 (Color online) Decoding performance of the soft-decision circuit (squares: experimental results). Fig. 10 (Color online) Optical power penalty as a function of coupling ratio. Fig. 11 (Color online) (a) Magnitude and (b) delay response of the delay line (squares: measured results). Fig. 12 (Color online) Pre-FEC BER as a function of pre-FEC Q (squares: experimental results).